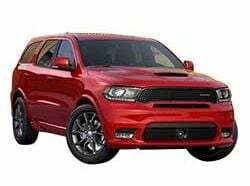 2018 Dodge Durango Trim Levels with Comparisons & Configurations. What 2018 Dodge Durango Trim Level Should you Buy? What is the Difference Between Trims? Straddling the line between the mid-size and large SUV segments, the Dodge Durango is a decisive renunciation of the market’s shift towards crossover vehicles. The Durango is a traditional SUV, and unapologetically so. It has strong, muscular styling and comes with an impressive selection of powerful engines. It is also incredibly versatile. It has comfortable seats for up to seven, while at the same time offering between 6,200 and 8,700 pounds of towing capacity. It also takes going off the road in a stride, which is not surprising since it is built on the same platform as the Jeep Grand Cherokee. The current Durango generation was started in 2011 after Dodge briefly cancelled the model, and saw a styling refresh in 2014. Since then, Dodge has only made slight changes to the Durango’s equipment, though the 2018 Dodge Durango now comes with a standard rearview camera and advanced infotainment. Like many Chrysler vehicles, it offers slightly more trim levels than average for the segment, and there are several optional packages available to further customize each model. This guide will help guide you through finding the right trim level for your next 2018 Dodge Durango by listing the features and options that are added or changed in each trim level. Compare the 2018 Durango SXT vs SXT Plus Trims. What is the difference? The base SXT model of the Durango earns a few additional features this year, such as the upgraded Uconnect 4 infotainment system with Android Auto, Apple CarPlay, Bluetooth, voice commands, USB, and a 7-inch touchscreen. It also has a rearview camera and a digital instrument cluster. Automatic climate control, push button start with smart entry, and five cloth-covered seats are all standard as well. The SXT comes exclusively with a 293-horsepower V-6 engine and an automatic transmission, and is available with either rear-wheel or all-wheel drive. As a base model, it is fairly short when it comes to options. Besides all-wheel drive, the only other available upgrades for the model are the optional third row of seating and an available towing package. Satellite radio is also available as an add-on. Beyond that and the ten available color options, the SXT arrives as-is. The slightly posher SXT Plus adds some comfort options to the SXT. It comes with built-in roof rails, a power driver’s seat, satellite radio, and rear parking sensors on top of the standard SXT equipment. The third row of seats is also standard on the SXT Plus. The SXT Plus also offers much more when it comes to options. The towing package is also available on the SXT Plus, but there are several more new ones as well. The Blacktop Package gives the Durango an exterior makeover with a black color scheme, as well as adding 20-inch wheels. The Anodized Platinum Package does the same, except with platinum accents. Both packages cover their 20-inch wheels in Bridgestone tires. The Popular Equipment Group is likely to turn out popular, as it includes heated seats and steering wheel, as well as a power liftgate and an auto-dimming rearview mirror. The Chrome Appearance Group adds chrome exterior elements, while the Running Board Package adds running boards and door entry guards. Other available additions to the car’s equipment include foldable captain’s chairs for the second row, a CD player, and a power sunroof. The base SXT is a relatively good deal, being fairly inexpensive, but it is hampered by not including the third row and having a limited selection of options. For a bit more money, the SXT Plus is both more customizable and more versatile, which is likely to make it more appealing to the kind of family buyers that frequently purchase vehicles like that. The SXT Plus becomes a better value once the various available packages are added, especially the useful and inexpensive Popular Equipment Group or the optional captain’s chairs. Compare the 2018 Dodge Durango SXT Plus vs GT Trim Levels. What is the difference? Despite the name, the Durango GT comes with the same base V-6 engine as the SXT and the SXT Plus. Instead, it loads up on comfort features for both the driver and the passengers. The upholstery on the GT is made of Capri leather with suede inserts, and both the steering wheel and the front seats are heated. The second-row seats are heated as well, while the front seats are both power-adjustable, with a memory function for the driver. Other goodies like LED running lights, paddle shifters, remote start, and a power liftgate are also standard on the GT. The trailer package and the Blacktop Package make a return, as does the CD player and the second-row captain’s chairs. Beyond that, the GT offers a number of new packages. The Brass Monkey Appearance Package gives the Durango its own set of 20-inch wheels, as well as gloss black badges and grille. The Premium Group adds a Beats sound system, moonroof, navigation, and both HD and satellite radio. The Technology Group covers the advanced safety features, adding adaptive cruise control, forward collision warning with brake assist and automatic emergency braking, lane departure warning, blind spot monitors with rear cross traffic alert, and rain-sensing windshield wipers. The Rear DVD Entertainment Center adds two Blu-Ray compatible screens to the second row. The Safety/Security and Convenience Group mixes in some features from other packages with a number of unique additions, including auto-levelling headlights with automatic high beams, blind spot monitors with rear cross traffic alert, high-intensity headlights, a powered steering column, and rain-sensing windshield wipers. The navigation is also available as an individual upgrade. The Durango GT covers almost all of the important mid-range and premium features that buyers usually want on their family transporters. The trim represents a sizable jump in price over the SXT Plus, but can be worth it to those who want a leather interior and advanced features. However, the GT does not offer any advanced in functionality over the SXT Plus, with the same engine, transmission, and seating arrangements, so it may not be worth the upgrade for more thrifty customers. Compare the Durango GT vs Citadel Trims. What is the difference? The Citadel trim further adds on to the comfort and luxury features, while also being the first one to offer a V-8 option. The optional 5.7-liter HEMI V-8 gives the Citadel 360 horsepower and raises its towing capacity to 7,400 pounds. The Citadel also comes with a strong set of standard features regardless of the engine choice. Included are 20-inch wheels, high-intensity headlights with automatic leveling and high beams, Nappa leather, ventilation for the front seats, a navigation system, a nine-speaker Alpine sound system, a sunroof, rain-sensing windshield wipers, and both front and rear parking assist. If that was not enough to satisfy those looking for comfort and technology features, the Citadel also offers several optional packages. The Trailer Group, Chrome Appearance Group, and the Running Board Package make a return, as does the Technology Group. The Citadel exclusive is the Premium Entertainment Group, which combines the Beats sound system with the rear seat video package. Second-row buckets are also available. The Citadel trim level adds some nice equipment, but little of what is not available on the GT. Instead, its biggest selling point is as the mass-market model with the V-8 engine. That really embodies the versatility of the Durango, as it is both a comfortable premium model and a high performance one. But if the V-8 engine is not interesting, then the GT is the more responsible choice. Compare the Durango Citadel vs R/T Trim Levels. What is the difference? Close in price to the V-8 Citadel, the R/T is the more sport-oriented Durango model. It comes standard with the V-8 engine, and both rear-wheel and all-wheel drive are available as usual. It mostly shares its standard features with the Citadel, though it lacks a moonroof, has slightly different wheels, and comes with LED fog lights and a performance steering and suspension. Its feature list is pretty much identical to the Citadel, though it can also add the missing moonroof and roof rails as well. Uniquely to the R/T, it is possible to order this Durango with a variety of different racing stripes for a “full performance SUV” effect. The R/T offers an interesting option for drivers who want to get the V-8 engine for a little cheaper than on the Citadel, though the lower price is offset by the smaller number of standard features. For the same equipment, an R/T is slightly more expensive than a similar Citadel model. But the difference is small, so the R/T can be a good choice for those who want the more performance-oriented aesthetic. Just keep in mind that the improved steering and suspension won’t turn this heavy SUV into a racecar. Compare the 2018 Dodge Durango Citadel vs Citadel Anodized Platinum Trim Levels. What is the difference? The top comfort trim level on the Dodge Durango, the Anodized Platinum is a slightly more upscale version of the regular Citadel. It comes standard with the second-row captain’s chairs, and they get seat heating. The front seats are both heated and ventilated in this model, and all seats are clothed in Nappa leather with perforated inserts. Navigation is standard, as are high-intensity headlights. Beyond those features, the Anodized Platinum model also features a soft-touch hand-stitched instrument panel, 20-inch chrome wheels, and several exterior chrome trim pieces. The Tow Package, the Technology Group, and the Premium Entertainment Group are the only options aside from the two engines and the front-wheel drive and all-wheel drive configurations. The Citadel Anodized Platinum can be best summarized as the Citadel trim with a little more. The heated second row is nice, as is the front seat ventilation, but the rest of the trim is for looks. For some, this is worth the $4,000 upgrade over the regular Citadel. The rest should stick with the base model. Compare the 2018 Durango Citadel vs SRT Trims. What is the difference? With the SRT, the Dodge Durango gets the full racing treatment from Dodge’s experts in the field of going fast. The major component of that is the 6.4-liter HEMI that comes standard on the SRT and gives it 475 horsepower to play with. It comes standard with a performance-tuned all-wheel drive system, Brembo brakes, Bilstein active suspension, and SRT software with different performance-focused driving modes. It also comes with active noise cancellation and an SRT steering wheel with paddle shifters. The Trailer Package, the Technology Group, and the Rear DVD Entertainment are available on the SRT. It can also be equipped with the SRT Interior Appearance Group, which adds the soft-touch dashboard from the Anodized Platinum Citadel as well as carbon fiber accents. A moonroof can also be added, and the third row deleted from the model. The SRT name means a lot to fans of American performance cars, so a Dodge SUV with that label will get some looks. It certainly makes for a very versatile vehicle, as it has the capability of ferrying up to seven people while also hitting sixty miles per hour in 4.4 seconds from a stop. There are not a lot of people who are regularly called upon to do both, but they are exactly the people for whom the SRT holds the best value. Despite the increasingly impressive features and performance options, it is likely that most buyers looking for a 2018 Dodge Durango will stick with one of the SXT, GT, or Citadel trim levels. As a two-row vehicle, the base SXT simply faces too many better and cheaper mid-size SUV competitors that offer the same five seats. The SXT Plus is where the Durango really begins thanks to the seven seats and the large selection of options. The GT adds leather into the mix, while the Citadel covers most of the upscale essentials and offers an optional engine. Most drivers will probably skip the R/T, and the Citadel Anodized Platinum offers more looks than features for its price. The SRT is a great car, but is aimed at a very specialized audience that is willing to accept its $60,000 price tag.